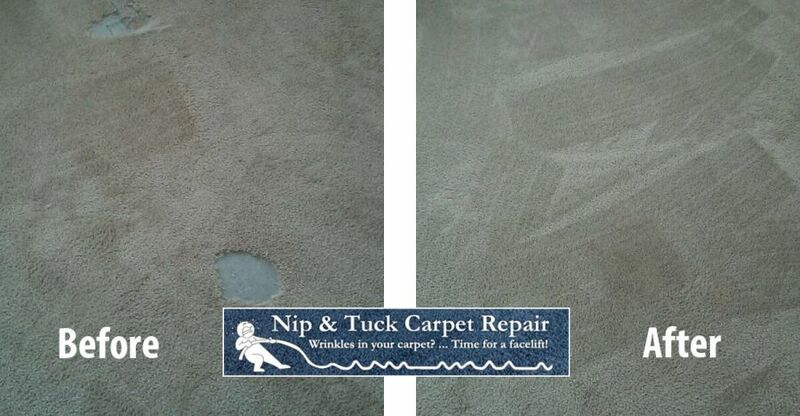 Nip Tuck Carpet Repair services the Boulder, CO area. No matter what your needs are Carpet Stretching, Pet Damage or Patching we can help. At Nip & Tuck Carpet Repair, we can match the exact carpet needed to repair any problem stain area or fraying parts in the carpet. From carpet bleach stains to giant ripples in your carpet, we have seen it all. No more wrinkles! Backed by our 5-year guarantee. This hole is pet damage at a rental property in Colorado. Colorado is a pet state and for all your pet problems when it comes to carpet, Nip & Tuck Carpet Repair is here for you. Pet rips, holes, or anything else we can fix all your carpet problems. The patch needs to be cut precisely. If it is too big it can buckle. If it is too small you will see the seam. The patch needs to be seam sealed correctly. The backing of carpet consists of a primary backing and a secondary backing. When a patch is cut, these can tend to separate, especially when there is foot traffic. These backing materials need to be seam sealed together to reduce yarn loss and separation of the primary and secondary backings. If there is too much adhesive applied, it will get into the yarns and ruin the seam. If there isn’t enough glue, it will not be an effective seam seal. The patch needs to be seamed as flush as possible to the carpet backing. While seaming, the backings need to be pulled together. If not, it will result in yarns being pulled down into the glue of the seam tape. After the patch is finished, it needs to be trimmed and vacuumed to make sure that no yarns will come loose after we leave. Call us today for a free estimate. We strive to provide an approximate estimate before arriving to complete the work. Estimates can be given over the phone , via email , or on-site . Prices can vary depending on dimensions, layout, seams, or excessive furniture. Due to those variables we will give an exact estimate on site before beginning the work.